With today's release of its Visual Networking Index (VNI), Cisco once again introduced the world to the mind-boggling compilation of zettabytes and petabytes that the world's growing Internet base will soon be hurtling through from a growing array of devices and platforms. Amid this year's numbers are Visual Networking Indexmany highlights and pearls of insight that can help service providers design their own infrastructure, decide on future technology and personnel investments, and determine the directions their organization should take (or avoid). Here's a look at three broadband trends and what they mean for operators. One of the biggest challenges facing broadband providers in the next five years is not preparing for the steadily increasing growth in daily traffic by Internet users worldwide. Rather, it is the spike in demand during peak hours for speed-hungry, symmetrical applications such as video, that operators must address for about 60 minutes. 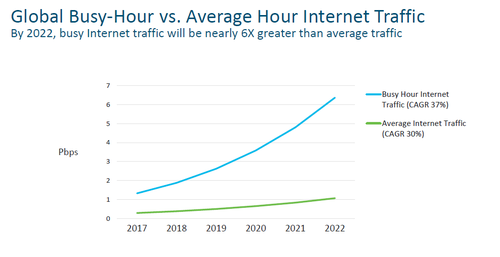 In fact, by 2022, peak-hour usage -- or "the busiest hour" -- will be six times more active than the average hour, according to Cisco's VNI.This busy-hour Internet traffic will increase 37% between 2017 and 2022, hitting 7.2 petabytes per second by 2022, VNI reports. Average Internet traffic, by comparison, is predicted to grow 30% over that timeframe, reaching 1 petabyte by 2022, according to Cisco. More than 50% of all devices and connections will be machine-to-machine in 2022, compared with 34% in 2017. 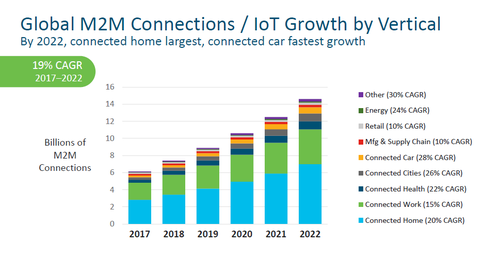 Customers will need storage -- primarily cloud-based -- for much of the music, video and other content pouring in and out of 14.6 billion smart speakers, light bulbs and any other connected thing, versus 6.1 billion in 2017. This ties in with smart home growth -- 20% CAGR over the report's five-year period -- and smart cities, predicted to increase at 26% CAGR. These connected locales are not the fastest-growing verticals or markets, however, according to VNI. Service providers should consider their existing or anticipated business models and how other high-growth areas such as connected car (28%), connected health (22%) or connected work (15%) tie in. Energy also is explosive, with CAGR of 24%, VNI reports. Unsurprisingly given our usage history, the amount of traffic each individual generates will increase at an astounding rate. That's due to a combination of the anticipated growth in connected devices (to 28.5 billion fixed and mobile personal devices and connections, up from 18 billion in 2017 or 3.6 networked devices or connections per person, from 2.4 per person) and four-fold growth in video and gaming traffic. We'll watch and create more video, especially 4K video, VNI predicts -- an estimate in line with many other research firms and matched by the reams of commercials, online ads and newspaper fliers bombarding consumers this holiday season. There's little doubt that, with the price of 4K TVs dropping so dramatically and content creators leveraging the high-quality displays, these screens soon will be ubiquitous. Currently the domain of gamers and the occasional training department or government agency -- think Defense -- artificial intelligence and virtual reality will hit corporate America within the next half-decade. This buy-in will generate 65% CAGR between 2017 and 2022, generating 4.02 exabytes in five years, compared with 0.33 exabytes last year. What are your biggest takeaways from this year's report?